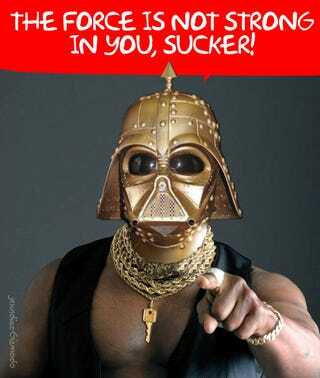 Mr. T doesn't understand all this jibba-jabba about Star Wars and steam punk! I ain't gettin into hyperspace, Han! They need Mr. T to install'em a new engine and shielding in da Falcon! And I pity that chump, Darth Vader, always having to wear that stupid mask. But I like this gold steampunked mask and chest thing 'cause I like the paint job and the nozzles! You heard me, suckas? NOZZLES! Jump to see all the pictures 'cause I'm heading to eBay to buy it!